"Blessed are the poor in spirit, for they shall see the kingdom of heaven." George's voice boomed through the village streets causing the coal miners and citizens to stop and search for the source. A small, natural hill was his stage and the blistering cold and wet February English weather was his backdrop. Using his theatrical talents, he departed from traditional monotone sermons and brought the Bible to life. Projecting his voice, his words traveled throughout the city grabbing the people's attention. George recited the story of Jesus, from His birth to His resurrection, with passion and tenderness. From Hell to the cross, George continued to preach the Good News of Jesus Christ as upwards of 200 villagers congregated around. They gathered out of curiosity. They stayed for the message. By the time George was finished, the hard, tired, blackened faces of the coal miners were softened and cleansed by the tears that were running down their cheeks. One man approached George after the sermon. Holding his granddaughter's hand, he thanked George for reminding him of the Christmas story. He explained his mother had told it to him when he was a child but he had forgotten it long ago. He never told his children and they never told his grandchildren. The man was so joyful that the gift of the Gospel had been given back to him to share with his family. The Church of England had dismissed the villagers of Kingswood as poor, unsophisticated simpletons who reveled in their sin. They were not worth the church's time, like the people in so many other little villages in England, so the church did not bless the area with a parish of their own. As with the reformers of the 16th century, George recognized how the church had grown cold and uncaring, desiring power over saving souls. When George Whitefield had entered the ministry at age 17, it was more of a job than a calling. He had worked for years in the family inn helping his widowed mother, but he desired a profession with more prestige. While attending Oxford, Charles Wesley loaned him Henry Scougal's The Life of God in the Soul of Man, which opened Whitefield's eyes and heart to the love of God. He became on fire for the Lord and believed one's faith should be felt in the soul. He began to understand that one should have a deep relationship with God, not just a fleeting friendship on Sundays. By the time he was ordained a minister in the Church of England at age 22, his passion for the Word had already begun changing others. Along with the Wesley brothers, John and Charles, the three men inspired the teachings now known as the Methodist denomination. A strong "Calvinist", Whitefield and the Wesley's eventually had several disagreements about theology. Regardless, Whitefield never considered himself anything other than a Christian. His sermons inspired members of many denominations, including Baptists, Presbyterians, Congregationalists, and others. At the beginning of Whitefield's ministry, churches were eager to have him preach. Whitefield's charismatic style drew in thousands to the pews. He not only revealed the love and sacrifice of Jesus Christ, he also spoke of freedom and personal responsibility for your own faith. The church leaders quickly feared his message was undermining the authority of the church, challenging their power and hold over their parishioners. This attitude expanded across the Atlantic Ocean to the American Churches of England as well. When Whitefield returned to England from his first trip to The New World in 1739, he was not welcomed in the church's pulpits anymore. Following in the footsteps of Christ's own ministry, Whitefield knew the souls that truly needed the Good News were not those in the pews, but the ones rejected by those in authority. They were the ones being outright ignored by the church. Since he was no longer allowed a venue for the people to come hear him, Whitefield decided to take his message to the people, especially those who did not already know the Gospel. His mission started humbly in the small coal-mining village of Kingswood. God blessed his endeavor. The day after Whitefield's life changing sermon in Kingswood, he returned to speak again. This time the crowd was 2000 strong. By Sunday, men, women and children had traveled from neighboring villages for an audience of over 10,000. Such huge crowds soon became the norm, rather than the exception. Whitefield became known for his ability to project his voice so loud and so far that groups of tens of thousands could easily hear him as he preached. Although he cultivated a church in nearby Bristol, he realized his true calling was evangelizing. When in Philadelphia, Whitefield forged a strong friendship with Benjamin Franklin, who saw the importance of Whitefield's sermons even though he was a self-proclaimed Deist. Franklin published Whitefield's work, allowing his tracts and sermons to reach over half of the colonists. After one of Whitefield's sermons, Franklin commented, "wonderful... change soon made in the manners of our inhabitants. From being thoughtless or indifferent about religion, it seem'd as if all the world were growing religious, so that one could not walk thro' the town in an evening without hearing psalms sung in different families of every street." Whitefield’s ministry and witness to Franklin eventually resulted in Franklin becoming an avid reader of the Bible and member of a Presbyterian church. For decades the name George Whitefield was as widely known and respected as Benjamin Franklin himself. During Whitefield's 1764 trip to America, he warned the colonists there was a "deep laid plot against your civil and religious liberties," coming from England. Still loyal to the crown, Whitefield also sympathized with the rejected colonists. As with the forgotten coal miners who were nothing more than necessary workers to the elite, Whitefield saw the same abuse happening to the colonists. As no one is perfect except Christ, Whitefield had his faults. He was an advocate of slavery though he insisted that they should be treated humanely. Teaching his own slaves about Christ, he treated them with respect and dignity. He was extremely critical of those who abused and neglected their slaves. Whitefield gave many sermons to the Negros and was credited for bringing the Gospel and Christianity to the slave population. Many rejected his efforts as they were afraid if the slaves were taught about spiritual freedom and liberty given through Christ, they would also desire it civilly as well. Many believe there would not have even been an American Revolution if not for George Whitefield, even though he passed away years before in 1770. Benedict Arnold, before he became a traitor, honored Whitefield on his way to Quebec in September of 1775. Arnold and his troops stopped by the Old South Presbyterian Church in Newberry Port, Massachusetts, where Whitefield is buried. Being a Sunday, the troops worshipped God before Arnold took the officers downstairs to Whitefield's crypt. They opened the casket and each took a piece of Whitefield's clerical collar or wristband to wear in battle. When the Founders assembled to declare Independence in 1776, Whitefield's work was of major significance. His ministry was so influential that when the Declaration was written, it was not a foreign concept to the American population but simply a statement of principles they learned over years of sermons from their "Black Robed Regiment" ministers. Colonists had been taught the idea of Independence, free from the oppression of the crown and the state church, since Whitefield starting touring the colonies in 1740. 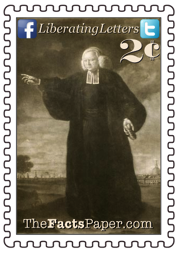 George Whitefield was born December 16, 1714, in Gloucester, England. In his short 55 years he preached over 18,000 sermons, which was an average of 10 a week, speaking to an estimated 12 million people. Traveling to Scotland 15 times, America seven times and Ireland twice, he ignited a passion for God's Word not seen since the days of the apostles. Even though it was taking a toll on his health, Whitefield continued a vigorous ministry till the end. His last sermon was preached in a field, standing on a barrel. Speaking on the insufficiency of works to merit salvation, he was suddenly inspired by the Spirit and cried out in a thunderous voice, "Works! Works! A man gets to heaven by works! I would as soon think of climbing to the moon on a rope of sand." His trip to heaven began the following morning, guided solely on the grace of Christ. As with the grandfather in Kingswood, America has long forgotten the Gospel. We have fallen from the faith and failed to pass on the salvation of Jesus Christ to our children and grandchildren. This Christmas season let us take a cue from Whitefield and go to the streets, telling of the birth and life of our Lord and Savior Jesus Christ. Let us seek out the lost, as Christ did, and show them the light, preaching of the grace and forgiveness given to us because of a tiny baby born 2000 years ago.